Mandy at edge of seventeen is hosting a Dystopian Teen Week over at her blog, starting today (well, it started this morning, but I’m a little late to the party…), and going until November 4. She’ll feature several Young Adult titles within the ‘dystopian’ genre, host giveaways, and talk to a couple authors, too! It’ll be fun. End-of-the-world, do-or-die kind of fun, in keeping with the thematic content, of course. 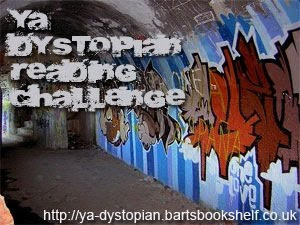 This is also happening in conjunction with the YA Dystopian Reading Challenge over at Bart’s Bookshelf. I am hereby accepting the challenge. After all, I can get all four items finished this week! Bart has a great round-up of reads in the genre in this post (make sure you check the comments, too!). A futuristic, imagined universe in which oppressive societal control and the illusion of a perfect society are maintained through corporate, bureaucratic, technological, moral, or totalitarian control. Dystopias, through an exaggerated worst-case scenario, make a criticism about a current trend, societal norm, or political system. It’s more than the opposite of utopia, which is what I thought when I saw the word for the first time. And it’s more than a post-apocalyptic scenario. It’s organized craziness. So why the heck am I interested in it? This is the girl who likes silly and funny and happy. I refer you to the title of this post. I may prefer silly, funny, happy…but when I read serious, seemingly hopeless, heart-rending dystopian novels (and I can’t help but do – they’re some of the best out there, and I’ll read ANYthing once), I truly feel. They get me. It’s liquid tragedy, gorgeous misery, and it seems REAL. I can imagine any of these things happening. I believe that there’s darkness in the hearts of men. Mostly, though, they make me cry. I know it’s a good book when I’m crying. Happy reading! And a big thank you to everyone who entered – I enjoyed reviewing each and every response! I’m going to gush for a second. Gail Carriger’s Soulless is a pretty freaking sweet read. It was absolutely perfect for a quiet, rainy Friday night. Hilarious, sweet, feisty, interesting (or am I just talking about main character Alexia Tarabotti? ), and what I’d have to call my ideal mix of paranormal, sci-fi and ROMANCE. I’ll admit it. I’m a closet trashy romance reader. Recently I’ve been cutting down on reading said books and looking for fantasy and sci-fi with a relational focus. Soulless totally did the trick for me. LOVED it. Why? Witty dialogue. Unique setting (I’m not a heavy steampunk reader, and if you aren’t either, this would be a great entry-level book). An amazing cast of characters, all of whom give you something to love, or wonder about, or just shake your head a little bit with a smile. Did I mention witty dialogue? Need I point out the fabulous cover art? The fact that this one is the first in at least a trilogy? That it has vampires (which I’m kind of over, but yeah), werewolves (SO hot) and parasols?! In other words, Soulless was for me. Also, I want Alexia’s wardrobe. Alexia Tarabotti is laboring under a great many social tribulations. First, she has no soul. Second, she’s a spinster whose father is both Italian and dead. Third, she is being rudely attacked by a vampire to whom she has not been properly introduced! Can she figure out what is actually happening to London’s high society? Will her soulless ability to negate supernatural powers prove useful or just plain embarrassing? And who is the real enemy . . . and do they have treacle tart? Recommended for anyone who might like light steampunk, werewolves, paranormal happenings, romance, London in the Gaslight Era, and funny (amusing funny, not ‘something might be a little off’ funny), comical amazing-ness. Enjoy! My pick this week is Elizabeth George Speare’s Calico Captive. If that name sounds familiar, it’s for good reason. Speare was the two-time Newbery Award-winning author of The Witch of Blackbird Pond and The Bronze Bow, and Newbery Honor book The Sign of the Beaver. She wrote wonderful historical fiction for younger readers, and though I love all of her works, Calico Captive became an early favorite. Early one morning in the year 1754 the stillness of Charlestown, New Hampshire, was shattered by shrill war whoops and the terror of an Indian raid. Young Miriam Willard, on a day which had promised new happiness, found herself instead a captive on a forest trail, caught up in the ebb and flow of the French and Indian War. It was a harrowing march north. Miriam could only force herself to the next stopping place, the next small portion of food, the next icy stream to be crossed. What waits at the end of the trail - besides an Indian gauntlet and a life of slavery? This story was a huge favorite of mine when I was eleven or twelve. At that point I was gobbling up books at the rate of 3 or 4 a day, but anything that was good slowed me down a bit. I think I read this one twice in a row in a damp tent on a family camping trip, and then dreamed about it for a couple of weeks afterward. It’s funny looking back now at the story. Back then I had an emotional connection to Miriam, but now I see changing attitudes toward history. I read this then as an impressionable girl. Now I read it with critical analysis. It’s still a great story, and the historical setting is (from what I can tell) pretty spot-on. The things that grate a bit on my sensibilities are the portrayals of Native Americans and the colonial French Canadians, and the treatment of religion. However, it’s a wonderful place to start learning about girls in American history and captive narratives, which were fairly popular in the late 18th century. I’d recommend this to fans of classic American children’s literature, historical fiction, history (in general and of the pre-Revolutionary Period), and anyone willing to go on an adventure with a brave young character. Enjoy! Who answered the question "What do you think of when you read the word ‘steampunk?" with: "I think of the Victorian aesthetic first, followed by the technological focus. And automatons! I love me some automatons." Congrats! 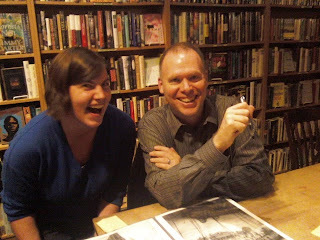 I had a great time at Scott Westerfeld’s Seattle event on Monday night at Third Place Books. He and Sarah Rees Brennan (of The Demon’s Lexicon fame) talked for a bit and then signed for the fifty or so who came. Ginny got her copy of Leviathan signed “To Ms. L’s Students: Read Me!” and I got mine signed for Memory (well, it’s not personalized, but you know)! Also got news while in the signing line that I’m going to be my college roommate’s maid of honor in March – so it was a wonderful night all around. Everyone: thank you for entering, be sure to check out the contest for Only Milo, and look for another giveaway next week! "I think of bustled ladies in crimson silk bordered gowns gleaming, smog belching, horseless carriages, delicate scarves wrapped ornately around their painted mouths so they can breath. A sky where the sun never truly rises, just struggles to seep through the dense blanket of lung-clogging grey. A skyline dominated by brightly glinting skyscrapers encased in brass jackets, with elevators creeping up and down their sides like glass beetles on grandfather clock trees. Men with top hats and cravats striding about importantly with clockwork hounds at their heals. And an underworld of rebellious urchins seeking to overthrow the aristocracy and take back the coal they pry from the resistant earth with bloodied fingers and pick-axes." And a (dorky) photo of me & Mr. Westerfeld. Yay! For my latest Everything Austen challenge item, I watched Northanger Abbey, a 2007 made-for-television film. A chance invite to the country home of a family friend results in the blossoming romance between hyperimaginative, romance fanatic Catherine Morland (Felicity Jones) and Henry Tilney (JJ Feild), the young master of the estate. Directed by Jon Jones, this charming, made-for-TV adaptation of Jane Austen’s posthumously published gothic parody also stars Carey Mulligan, William Beck and Desmond Barrit. It’s cute, funny, over-the-top cinematic goodness. Definitely recommended. I have to say I remember thinking that Austen’s Catherine was a bit of a twit, but this film made me reevaluate. Maybe she’s just very young? Anyway, it was silly and fun and the main characters were very well cast. I loved it, though I squirmed and groaned when those same characters ignored the obvious or got it wrong. The only, ONLY thing that I didn’t like was the final embrace. You’ll see what I mean when you watch it. But again, she’s so young that it almost works! And J.J. Feild, the dude who plays Mr. Tilney? Can act from underneath that hat! Loved him/it/everything. The movie was the perfect length (at an hour and a half), and I didn’t find myself remembering anything that should have been put in but wasn’t. Am I gushing? Maybe a bit… I’m just glad that this was the last Austen film adaptation on my list. I’m going out on a very positive note. Lost In Austen was on the original challenge post, but I think it’s high time I read some Austen spin-offs. Look for those in the next couple of months, and in the mean time, watch Northanger Abbey! Grade: A.
I’ve mentioned this a time or too, but my sister has a crafting blog. 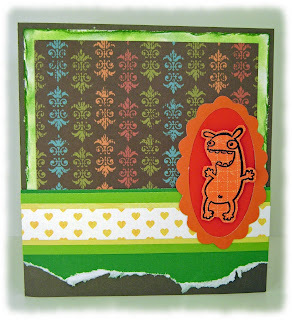 She makes cool cards. 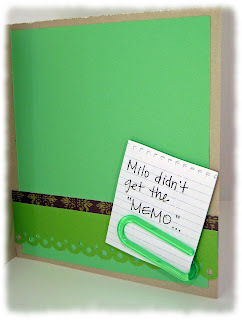 When I saw the cover of Only Milo, I immediately considered the paper possibilities, and asked her to craft a card (or two) inspired by the cover artwork. You see the results below. This is the real cover. 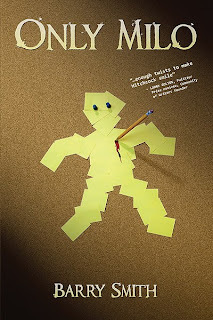 Murdered post-it man. From what I understand, the crazy fellow on the right is a murderous Milo? This is the inside of the above card. This one is my favorite. 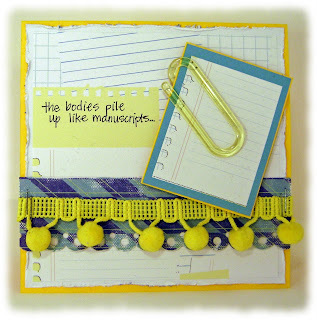 The post-it look is preserved, and it's bright! For an extra entry in the Only Milo giveaway, tell me which card is your favorite. Happy Saturday! I’m looking back through the beginning of my copy of Barry Smith’s Only Milo. I read it in two parts: the first half one night several weeks ago before bed, and the second half this afternoon. I didn’t break up the reading experience intentionally – it just happened. But what I’m noticing is that I read the two halves very differently. During my first reading session, I circled the first sentence on the first page (which reads, “Maybe it was the SPAM Reuben sandwich.”). I also underlined and commented in the margins until I quit reading that night. I was very gung-ho about ‘reviewing.’ When I picked up the story this afternoon, though, I just wanted to know what happened next. I flew through the rest, relishing the murder and mayhem and rushing headlong to see where it would lead me. I think Only Milo can be read either way. It’s got dark humor to savor like you would smooth, dark chocolate or a great cup of coffee. It’s also got action and a non-stop plot to keep you chuckling and racing to find out if Milo can possibly get away with it. Whichever route you take, Only Milo is a hilarious, snarky, up-to-the-minute novel for readers, writers and anyone who has ever secretly seethed that someone else got the credit of their work. …comes Milo, author and murderer extraordinaire. Educated at the School of Dexter, with a major in CSI, Milo emerges from his quiet, SPAM-laced retirement to become an unseen force in the literary world, covertly publishing his novels in another author’s name. But when Milo’s illicit ghostwriting is nearly exposed on national television, he’s left with only one option: murder. In a world of egotistical, no-talent authors and duplicitous, back-stabbing publishers, he becomes determined to get what he deserves. Even if it means they all must die. It’s subversive, witty, a little bit odd and a lot wonderful. I loved it! Please include your email address. Giveaway is open to US and Canadian residents. Comments will close on October 23 at 11:59pm EST, and I will notify the randomly selected winner via email. *Received a free review copy of Only Milo from Inkwater Press.